Since its debut in 2000, Vitaminwater has been an ever-popular sports drink, frequently endorsed by professional athletes. Vitaminwater is marketed as healthy since it is fortified with doses of common vitamins and minerals important to a balanced diet. However, some Vitaminwater products are loaded with added sugar, making the drink hardly more healthful than soda. Here are 5 reasons why Vitaminwater may be bad for your health. Vitaminwater is a beverage brand owned by the Coca-Cola Company. 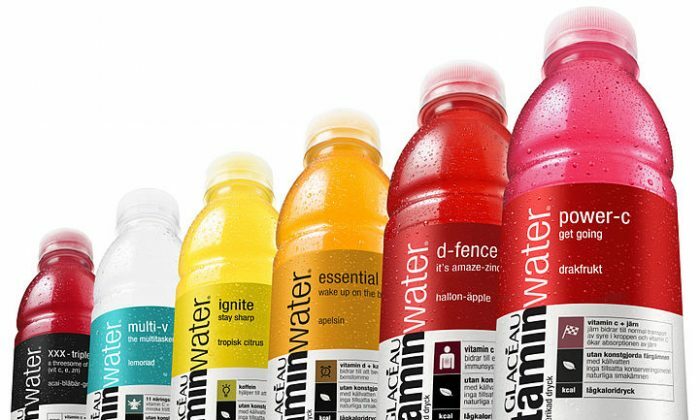 There are many varieties, each with an attractive name like “focus,” “endurance,” “refresh” and “essential.” As its name indicates, Vitaminwater is water enriched with vitamins and minerals. In addition to adding healthy stuff, Coca-Cola claims it adds natural colors and flavors as well. Vitaminwater is also loaded with added sugar—particularly fructose, which is linked to various health problems when consumed in excess. 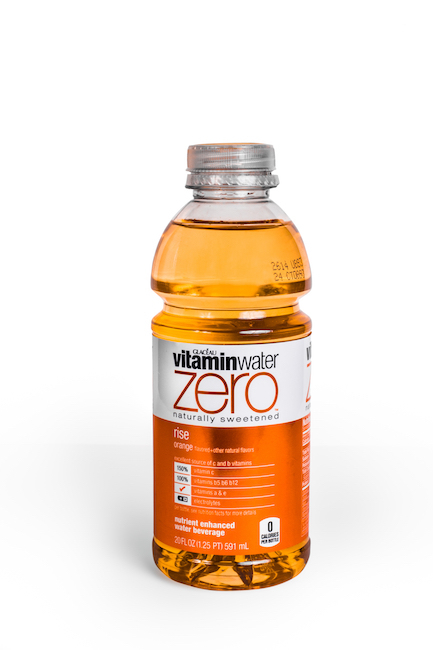 The “Zero” product line of Vitaminwater that has no added sugar is sweetened with erythritol and stevia. The first three sections of this article do not apply to Vitaminwater Zero. One 20-ounce bottle of Vitaminwater contains about 120 calories and 32 grams of sugar—about 50 percent less than a regular Coke. However, the type of sugar used varies between countries. In the United States, Vitaminwater is sweetened with crystalline fructose and sucrose, also called cane sugar—while sucrose is the main sweetener in other countries. Crystalline fructose is worse for your health than sucrose, as it’s almost pure fructose—over 98 percent. On the other hand, sucrose is half glucose and half fructose. A closer look reveals that a bottle of Vitaminwater in the United States may harbor the same amount of fructose as a bottle of regular Coke. That’s because the majority of the sugar in U.S. Vitaminwater is in the form of pure fructose, while fructose comprises only half of the sugar content of Coke. Many studies suggest that fructose—not glucose—is the main harmful component of added sugar. When it comes to weight gain or loss, what you drink is just as important as what you eat. When you consume calories from liquid sugar, your body does not compensate by making you eat less of other foods. The calories from these sugar-sweetened drinks then pile on top of everything you eat. Over time, this can lead to weight gain, increased risk of obesity, and other related diseases. Consumption of sugar-sweetened beverages is among the world’s strongest risk factors for obesity, with some studies showing up to a 60% increased risk of obesity in children for each daily serving. Health experts agree that added sugar plays a key role in modern epidemics of obesity and chronic diseases. It’s recommended not to consume more than 10 percent of your total daily calories in the form of added sugars—preferable less than 5 percent. For a 2,500-calorie diet, this equals 62 or 31 grams of added sugar, respectively. As one bottle of Vitaminwater supplies 32 grams of added sugar, that’s 50 to 100 percent of your recommended upper limit. Added sugar is strongly associated with type 2 diabetes, tooth decay, heart disease, metabolic syndrome and even cancer. This applies mainly to fructose, which can only be metabolized in significant amounts by your liver. Excess fructose consumption may increase your blood cholesterol, triglycerides, blood pressure, insulin resistance, fat buildup around your organs and risk of fatty liver disease. These are major risk factors for heart disease, diabetes, and obesity. Keep in mind that this does not apply to small amounts of fructose you get from fruit. Due to its water and fiber content, fruit has a low energy density—making it difficult to obtain too much fructose from food. All types of Vitaminwater contain B vitamins at 50 to 120 percent of the reference daily intake (RDI) and vitamin C at 50 to 150 percent of the RDI. Some types also boast smaller amounts of vitamins A and E, as well as the minerals potassium, magnesium, manganes, zinc, and chromium. Vitamins B and C are water-soluble vitamins that are almost never lacking in the average person’s diet. Consuming excess amounts of these vitamins does not provide any health benefits. Your body does not store them but simply excretes them via urine. That said, certain subgroups of people may be lacking in some of these vitamins and minerals — especially B12 and folate. However, it’s counterproductive to drink unhealthy, sugary beverages to get these nutrients. If you’re deficient in any of these common vitamins, it would be more beneficial to eat whole foods or take supplements instead of drinking sugar-filled drinks. Vitamins, minerals, and antioxidants are absolutely crucial as part of a healthy diet. They may improve health and help prevent a range of diseases, including heart disease and cancer. However, supplementing with vitamins or antioxidants has not been linked with the same health benefits. In fact, supplementing with some antioxidants and vitamins, such as vitamins A and E, may increase your risk of premature death. Although Vitaminwater does not have excessive amounts of these vitamins on its own, it does provide considerable amounts—25 to 50 perecent of the RDI for each vitamin. When you add 25 to 50 percent of the RDI on top of what you’re already getting from food, you could reach excessive amounts. Not only are the micronutrients in Vitaminwater unnecessary for most people, but they may also be dangerous if they’re bumping your intake to harmful levels. Though Vitaminwater may seem like a great beverage to add to your diet, it’s no more than a dangerous fad. The problem is that many people do fall for marketing claims. Most people don’t read ingredient labels and don’t realize how unethical and ruthless junk-food conglomerates can be. Despite the marketing tactics, Vitaminwater is an unhealthy beverage that you should avoid or only drink on special occasions. At best, it is a slightly less bad version of Coke. At best, it is just a slightly "less bad" version of Coke.